Civet Coffee is a cup of coffee using coffee beans taken from the rest of the mongoose/civet. Coffee beans are believed to have different flavors after being eaten and passed through the digestive tract of mongoose/civet. 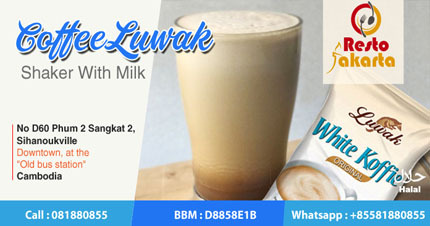 Resto Jakarta provides Cold Civet Coffee is shake with milk and ice, which is suitable to keep you company in hot weather.